Did you hear about the Welsh-speaking tribe of American Indians? No? 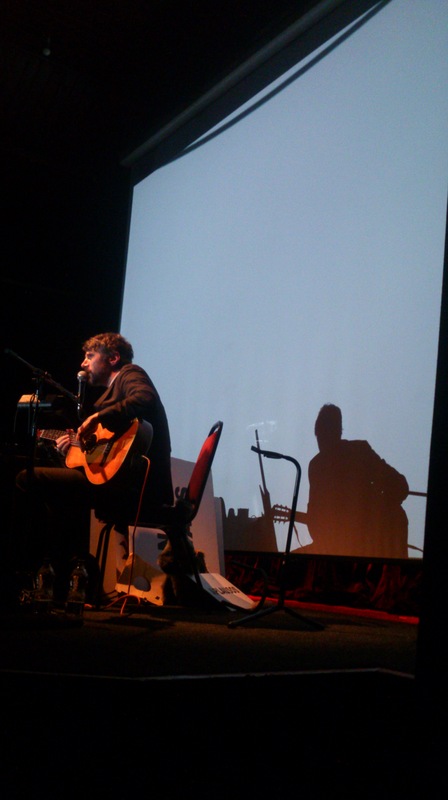 Well, indie rock genius Gruff Rhys is travelling the world, playing songs from his film, book, and album American Interior, which tells the tale of John Evans, the man who went to find them. The story starts with the Norman invasion, when the Celts were pushed back to the fringes of Britain, with the Welsh territory largely reduced to Anglesey and Snowdonia. Owain Gwynedd strengthened the kingdom, but on his death, his successors began to fight amongst each other, causing his son Prince Madoc to decide to set sail in search of new lands to settle. Apparently, he made it all the way to America and established a settlement in Mobile, Alabama. After returning to Wales to gather more supporters, he travelled up the Mississippi, eventually stopping near North Dakota. Here, his descendants remained, passing on their language and skills such as building coracles. That’s the legend anyway, and it became fairly popular in Elizabethan times, as Britain tried to claim more territory in the new lands of America by insisting that they had actually got there first. Some years later, Iolo Morganwg decided to raise an expedition to find this lost tribe and put Wales back on the world map. Unfortunately, there was only one applicant, John Evans. Evans and Morganwg set off to London to find some benefactors for their trip, but after little success, Iolo scarpered back to Wales, leaving Evans penniless in the big city. He decided to go ahead and travel to the US anyway. 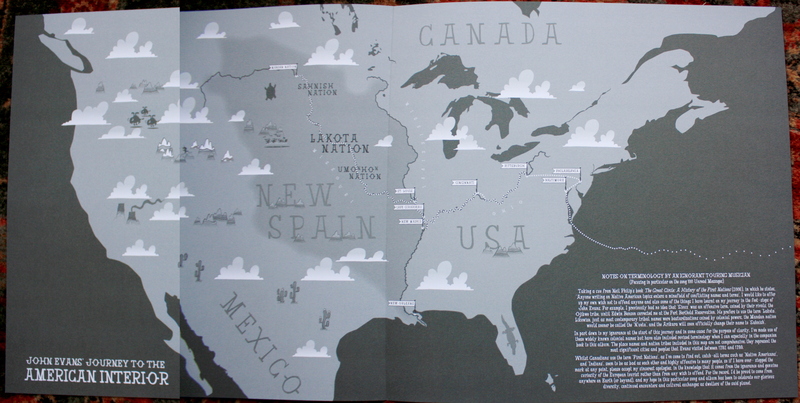 The inner sleeve of Rhys’ LP shows Evans’ route from Baltimore, then Philadelphia (“where they taught him to make maps”), and onwards to the Mississippi and finally to the lands of the Mandan in present day North Dakota. 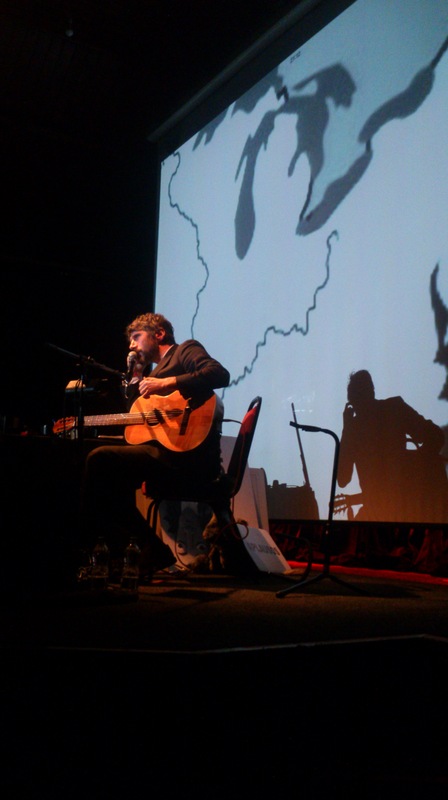 More maps and illustrations were on display during the show – here’s Gruff playing in front of maps of the Ohio River (“it looked exactly like this”) and the Canadian border at the 49th parallel (I think you probably had to be there). Evans had many adventures along the way including catching malaria, being imprisoned, defecting to the Spanish, persuading the English army to abandon a fort (thereby annexing the land for Spain), defending the Canadian border, and finally sailing the length of the Mississippi before dying in New Orleans. The whole saga is summed up excellently in the song 100 Unread Messages. 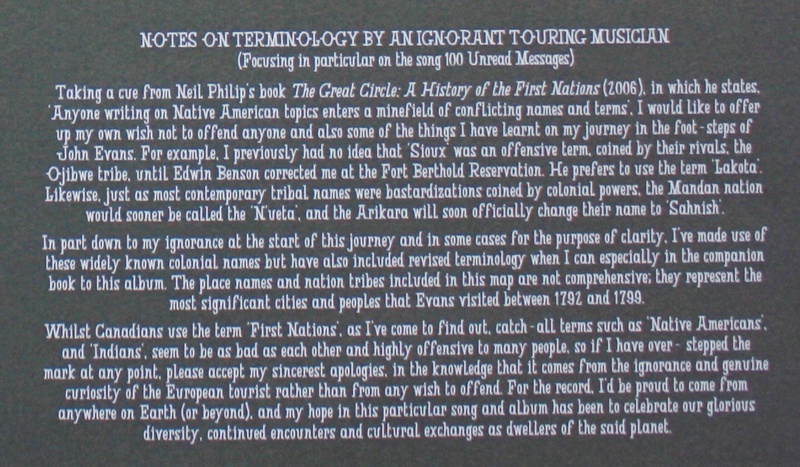 Rhys’ sleeve notes above (and detail below) highlight the difficulty of using the correct names when discussing the indigenous people of North America. History is written by the victors and too often, a name given by outsiders can stick, even though it causes offence. 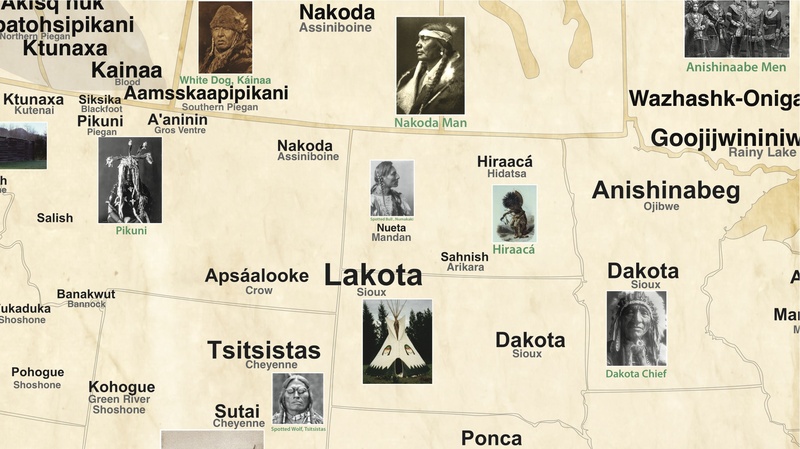 Luckily for us, a young cartographer has produced a map of Native American tribes showing their names and locations before the Europeans arrived. Below is a detail of the map, showing the Mandan nation, the most likely candidates for the lost tribe that John Evans was searching for. So, even though Evans never found the lost Welsh tribe, his efforts weren’t in vain, as his maps were used by Lewis and Clark during their journeys through the American west. Mystery still seems to surround Evans though, as the above site also seems to think he is Scottish. Oh well, as I’ve said before, print the legend.